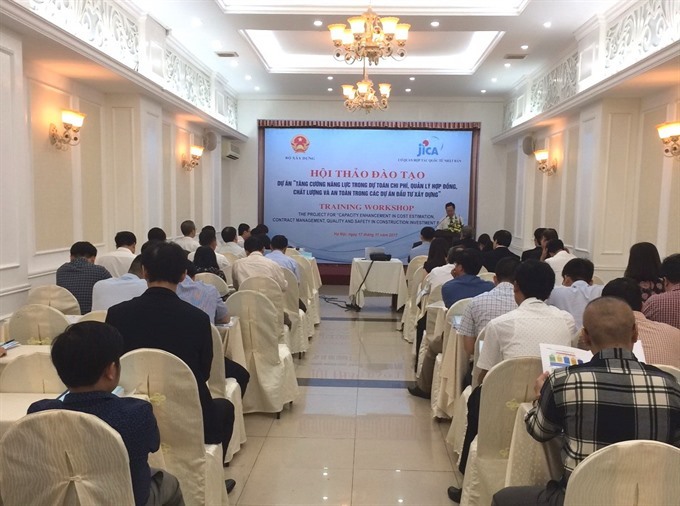 HCM CITY — The Ministry of Construction and the Japan International Cooperation Agency (JICA) yesterday organised a training workshop on management of construction projects in Việt Nam. The workshop was co-organised as part of a JICA-funded project, launched in April 2015, for improving capacity in cost estimation, contract management, and quality and safety in construction investment projects in Việt Nam. The workshop focused on quality management, safety and environmental management, and cost estimation. The event, which was attended by state agencies, project management units, contractors and consultants, discussed the project’s outputs and focal points related to Việt Nam’s laws and regulations on construction. The project, implemented by the Ministry of Construction and JICA, aims to improve the capacity of staff in the ministry and related organisations to ensure that all construction projects in Việt Nam are managed in accordance with international standards and regulations of public construction projects. Similar workshops will also be held in Đà Nẵng, Cần Thơ and HCM City. Việt Nam has maintained sustainable economic growth in recent years and implemented a large number of major infrastructure development projects. However, due to inadequate project management and quality and safety management of construction works, many construction accidents have been recorded.